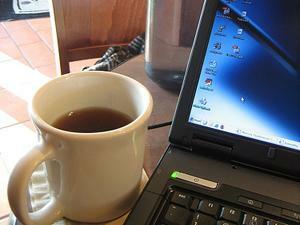 Telecommuting is on the rise at UC San Francisco according to the university’s annual commute survey. Those who telecommuted at least one full day in a two-week period notched up from 2.6 percent in 2017 to 3.4 percent in 2018. Those who telecommuted “when needed” increased from 12 percent in 2017 to 13 percent in 2018. These figures include faculty, staff, trainees and students. Not surprisingly, the 2018 survey also revealed that commute times are lengthening, with 10.2 percent reporting their commutes were longer than 1.5 hours each way, up from 7.3 percent in 2017. This finding suggests that an increased number of commuters are living farther away from campus and/or existing routes are more congested. A record number of participants - 6,144 in total - responded to the 2018 survey. This is up from 5,260 participants in 2017. “As part of the Construction Impacts initiative, we have been actively promoting the use of telecommuting for positions that are conducive to working remotely,” said Cathleen Stugard, chief of staff in Campus Life Services. She said this is especially true on days when roads are closed, and commuters are detoured due to construction or when an inordinate amount of event traffic is expected. 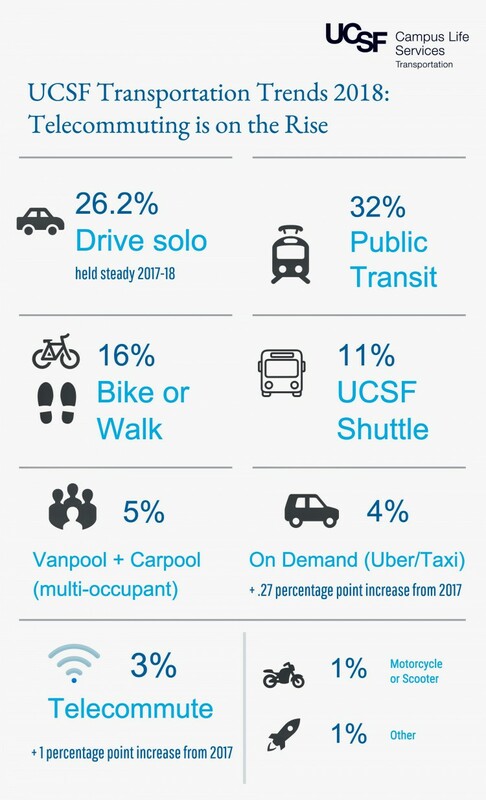 Telecommuting will continue to be encouraged, as appropriate, especially in the Mission Bay Area, as the Chase Center, multiple new UCSF clinical and research buildings, and new university housing opens in 2019 and 2020. Although still a few years away, the opening of the mixed-use development at Mission Rock (owned by the San Francisco Giants) will impact the Mission Bay campus and further increase the benefits of telecommuting. Not everyone at UCSF can telecommute. In fact, 51 percent of employees reported in the 2018 survey that their positions are not conducive to telecommuting. Most clinical positions require on-site work, which helps explain why just 1.7 percent of UCSF Health employees who responded to the survey are regularly able to telecommute. Approximately 4 percent of campus employees who responded indicated they were able to regularly telecommute. Department norms also play a significant role in the practice of telecommuting, with 17.6 percent of employees reporting in 2018 that their positions are conducive but that their department culture is not supportive of telecommuting. In 2017, only 15.3 percent reported departmental culture as a barrier. Assistant Vice Chancellor for Human Resources, Jenny Schreiber, said the university has a set of telecommuting guidelines but added that each individual department needs to determine if telecommuting is appropriate given local business needs. Additional findings from the 2018 survey can be found on the accompanying info graphics.